Novel Oral Anticoagulants (NOACs) have major pharmacologic benefits over warfarin, which is a vitamin K antagonist, together with the rapid onset/offset of action, few drug interactions and predictable pharmacokinetics. Warfarin has a limited therapeutic window that can be strike by factors such as diet and enabling patients on warfarin to monitor their INR regularly. The Anticoagulation Therapy market is expected to reach USD 31.4 billion by 2025, growing at a CAGR of 8.01% during the forecast period. Novel oral anticoagulant (NOACs) is the top performing segment as an alternative to anticoagulant. 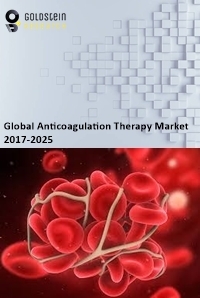 Increasing number of patients with lifelong medical aid therapy, growing prevalence of blood vessel thromboembolism, arrhythmia, and stroke, acceptance of NOAC’s is raising revenue in the market, rising outpatient anticoagulation therapy, increasing number of pipeline products under clinical trials and rising heparin trade spurring the growth of anticoagulation therapy market. However, high cost of developing drugs and risk of malfunctions like increased bleeding is main issue with newer agents are expected to impact the target market negatively. On the basis of region, North America accounted for the largest market share of anticoagulation therapy market owing to rising number of the hospital associated clinics and high healthcare expenditure. Europe is expected to grow at the higher rate and generate quite the substantial amount of revenue owing to rising incidence of venous thromboembolism, atrial fibrillation, and stroke. On the other hand, APAC is the fastest growing region, registering the CAGR of 8.1% over the forecast period due to long-term administration and high volume of recurring sales of anticoagulation drugs for long lasting medical aid therapy. Global Anticoagulation Therapy Market Outlook 2017-2025, has been prepared based on an in-depth market analysis from industry experts. The report covers the competitive landscape and current position of major players in the Anticoagulation Therapy market space. The report also includes porter’s five force model, SWOT analysis, company profiling, business strategies of market players and their business models. “Global Anticoagulation Therapy Market Report” also recognizes value chain analysis to understand the cost differentiation, pricing models to provide competitive advantage to the existing and new entry players. Our Global Anticoagulation Therapy Market Report comprises of the following companies as the key players: C. H. Boehringer Sohn, Bristol-Myers Squibb, Johnson & Johnson, Pfizer, Daiichi Sankyo, Portola Pharmaceuticals, Roche, Abbott, Siemens, Alere and CoaguSense.